How much energy does it take to cook with electricity? This is a very key question for the proposition. Most writing about African cooking is based on biomass cooking. Even with improved stoves control of the cooking process is nowhere near to that given by LPG gas, Kerosene, even ethanol gel, and of course electricity. It is this control that reduces the amount of energy required. However, even here although he acknowledges that modern energy requires a lot less than biomass, he does not dig into the details of the amount of energy required with modern cooking. Indeed I am not sure where he gets his 2 to 3MJ/capita/day which is 2.2 to 3.3KWh per day per household of 4 person. As you will know electricity is barely used in Africa for cooking, even among the elite. The reasons include price but are more often stated as variations on the theme of unreliability. I would argue that also Governments do not encourage use of electricity for cooking because it inevitably would add to the peak load, which they are already struggling with. The one exception to the rule ‘Africans barely use electricity for cooking’ is South Africa. With a steady supply and a level of wealth higher than many other African countries, it is possible to find people cooking with electricity. To me this is important as it speaks to the effect of the price point (IF reliability is there) and to the behavioural change question. Also from South Africa we can nuance how much energy it takes to cook an African meals. The key work I have found is Cowan 2008. Bill Cowan from University of Cape Town, as part of a EU funded project, actually got 80 households (household of 4) to cook with various fuels and measured their consumption. He tried different categories of meals from rice and pasta, to the long slow cook of offal meat. I attach an extract of his outcome. 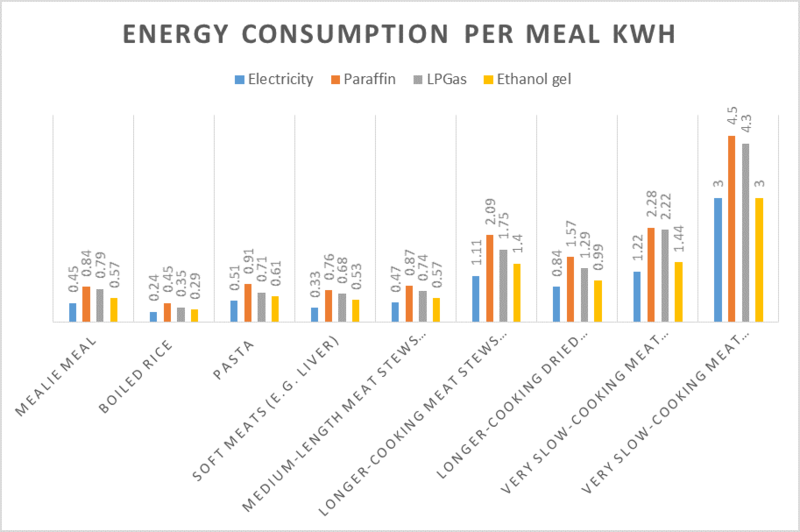 The bottom line to me is that a meal that has good meat takes about 0.5kWh (of electricity to cook), while a long slow simmering of offal or very poor cuts of meat can take over 1kWh. Other works tell us that the norm for poorer sections of Africa (and indeed the world) is two meals a day, while the poor can sometimes be reduced to one meal a day. It is true that aspirational is three meals a day, but I don’t believe a design should be based on this. Logic then suggests that these two meals are unlikely to both be long slow simmering of offal. One may be a long burn, while the other is a reheat of yesterdays food. Similarly, there may be two rice based meals. I have therefore in my calculations and notes so far taken 1.2kWh of useful electricity as my average requirement per day for a household of four.